Office Space - Rotorua, Bay of Plenty. 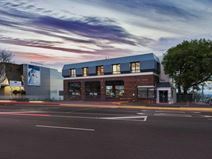 On Fenton Street you will find Rotorua's first contemporary, shared office space perfectly positioned within the heart of Rotorua's CBD. Only a stone's throw away from Lake Rotorua, this space is in a prime location to take a walk during your lunch break. With space available on short and long term basis; designed for people looking for a modern and professional office space; wanting to network and collaborate with like-minded people. Plug-and-play pods are available in an open plan area that is shared with twelve other people and there is also a 16-seat executive boardroom equipped with state of the art technology, and a smaller meeting room available for use.